"Magazine, Second Hand Daylight - OBI Box Set - 4 Minis"
MAGAZINE - SECONDHAND DAYLIGHT - Japanese OBI MINI REPLICA LP TITLES making a 4 CD Box Set- Japanese OBI MINI REPLICA BOX SET Japanese er-mastered Mini LP replica Limited Edition Collection Recorded from the finest Original Masters available. Each title Comes with anti-static sleeves similar to Vinyl LPs, Cardboard packaging exact to the original LP, Re-sealable plastic wrap cases for protection of each collectible and includes extensive Liner Notes Booklet. Actual miniaturized version of the 12" LP in 4" CD version Special VERY RARE LIMITED EDITION BOX SET ONLY PRODUCED ON FUTURES FOR THIS ONE TIME PRESSING -- were only available in Japan. 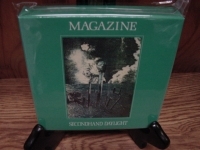 THE MAGAZINE BOX SET - SECONDHAND DAYLIGHT INCLUDES CORRECT USE OF SOAP - Track Listings 1. Because You're Frightened 2. Model Worker 3. I'm A Party 4. You Never Knew Me 5. Philadelphia 6. I Want To Burn Again 7. Thank You (Falettinme Be Mice Elf Again) 8. Sweetheart Contract 9. Stuck 10. Song From Under The Floorboards 11. Twenty Years Ago 12. Book 13. Upside Down 14. Light Pours Out Of Me-Version MAGIC, MURDER & THE WEATHER - Track Listings 1. About The Weather 2. So Lucky 3. Honeymoon Killers 4. Vigilance 5. Great Man's Secrets 6. This Poison 7. Naked Eye 8. Suburban Rhonda 9. Garden 10. In The Dark 11. Operative REAL LIFE - Track Listings 1. Definitive Gaze 2. My Tulpa 3. Shot By Both Sides 4. Recoil 5. Burst 6. Motorcade 7. Great Beautician In The Sky 8. Light Pours Out Of Me 9. Parade 10. Shot By Both Sides-Original Single Version 11. My Mind Ain't So Open 12. Touch And Go 13. Goldfinger SECONDHAND DAYLIGHT - Track Listings 1. Feed The Enemy 2. Rhythm Of Cruelty 3. Cut-Out Shapes 4. Talk To The Body 5. I Wanted Your Heart 6. Thin Air 7. Back To Nature 8. Believe That I Understand 9. Permafrost 10. Give Me Everything 11. I Love You,You Big Dummy 12. Rhythm Of Cruelty-Original Single Version 13. Tv Baby These are Japanese digitally re-mastered Mini LP replica CDs (the OBI Edition). This Limited Edition Collection has only VERY FEW made world-wide and are immediately Out of Print. Recorded from the finest Original Masters available. Comes with anti-static sleeves similar to Vinyl LPs, Cardboard packaging like an LP, includes extensive Liner Notes Booklet. Actual miniaturized version of the 12inch LP in 4inch CD version.